Once in a while I get asked questions by those who know of my interest in Liberty Seated quarter die varieties. One of the questions that has come up several different times is, “How do I tell a new reverse hub 1840 quarter (Briggs reverse B) from the transitional reverse (Briggs reverse A)?” I think that a big reason this question gets asked is that there is an error in Larry Briggs’ The Comprehensive Encyclopedia of Liberty Seated Quarters (Lima, OH 1991). The error is that the photograph labeled “New Hub Design Reverse 2-B” is actually an example of the transitional reverse A. This is the same die that is pictured on the previous page and labeled as reverse A. The book, overall, is a remarkably complete and accurate reference; however, it is not perfect, and in this case a typographical error leads to some confusion. 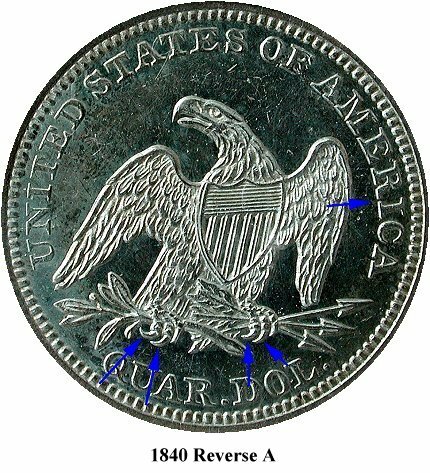 The keys to attributing the 1840 reverses are the eagle’s claws and the lettering in AMERICA. 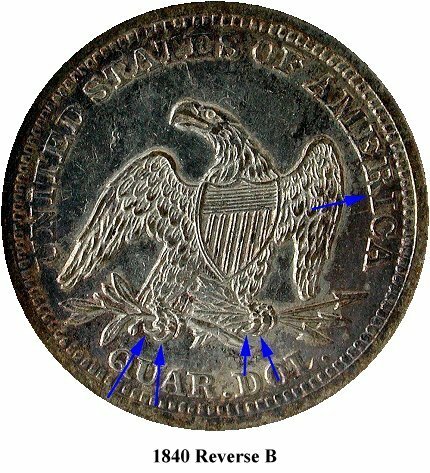 The shield lines can also be used to reliably distinguish the two dies in coins graded high enough for them to be visible. One should also note that the descriptions provided in Briggs’ book are quite detailed and accurate for these two dies – it is only the picture that is inaccurate. The two reverses are illustrated in the photos below. Hopefully this will help alleviate some of the confusion.